A crate is thrown into an iron barrel and the fire flares up. But it doesn’t get really warm: the ice cold wind blows along the plastic sheeting that it is hoped will offer some protection against the weather. The group of men from Batman, in the south-east of Turkey, have been living on the street in the city centre of Ankara for a few weeks now. Next to their tent are the workers from Izmir, and next to them is a tent from Aydin, the neighbours are from Bitlis and their neighbours again are from Istanbul. You see, the workers from Tekel come from all over Turkey. Tekel, that is the state alcohol and tobacco company, founded in 1925 under the auspices of Atatürk himself. It has been producing drinks and smokes for Turks for decades, but in 2008 the company was privatized and sold to British American Tobacco. Many alcohol factories have already closed down for efficiency reasons. On the last day of January, two days ago, the last tobacco warehouses that were still under government control were closed down. The workers were given a choice: either get fired, or work for another state company and earn half the salary and lose practically all your benefits. Since that is a choice between two evils and the government didn’t react to any requests from unions to talk about the workers rights, from mid December on the workers decided to protest. They left their warehouses in their home towns and came to Ankara. The protests get a lot of attention in the newspapers, and Tekel has become a symbol of the protest against the way the government handles privatizations. There is a general feeling of there being no respect for workers’ rights, and what makes it worse is that many state companies are sold to foreign companies. The resentment against that is deep: many of the state companies were founded by Atatürk, who gave Turkey its independence by kicking foreign powers out of the country. Now Erdogan sells the state companies and lets foreigners in again through the back door to take Turkey down. The solidarity in Ankara was impressive. I was there on the day that the biggest union, Türk-Iş, organized a big demonstration, halfway through January. At first, I didn’t see any Tekel workers. Instead I saw, in the pouring rain, members of other unions: the mineworkers were there, the municipal workers, the shipyard workers, the steel workers, and of course, the ever-present hammer and sickle flag-waving members of TKP, the communist party of Turkey. And when I came to the tents of the workers at the centre of the whole protest, I saw solidarity too. Since the protest took place in the heart of Ankara, shop owners came to bring the workers all sort of materials they could burn to keep warm, like crates and shoe boxes, barbers were offering free shaves, citizens gave blankets and food. I was especially struck by three women I talked to, from the province of Batman. I once visited the village they were originally from, Sason, and remember the disused Tekel tobacco premises there. These women worked there, but were transferred to Istanbul with their families in a previous reorganisation that was linked to the privatization. Life in Istanbul is hard, the women said. They were supporting their families with their 1200 lira income. Their husbands all worked but mostly in temporary and badly paid jobs. What would happen if all of a sudden they had to work for 650 lira a month, with hardly any benefits? And under the condition that they could be transferred every few months to any part of the country to work for the state? What would it do to the lives of their children? Mind you, their transfer from Sason to Istanbul, 1200 kilometres away, was already a life-changing event for these women with only a primary school education. 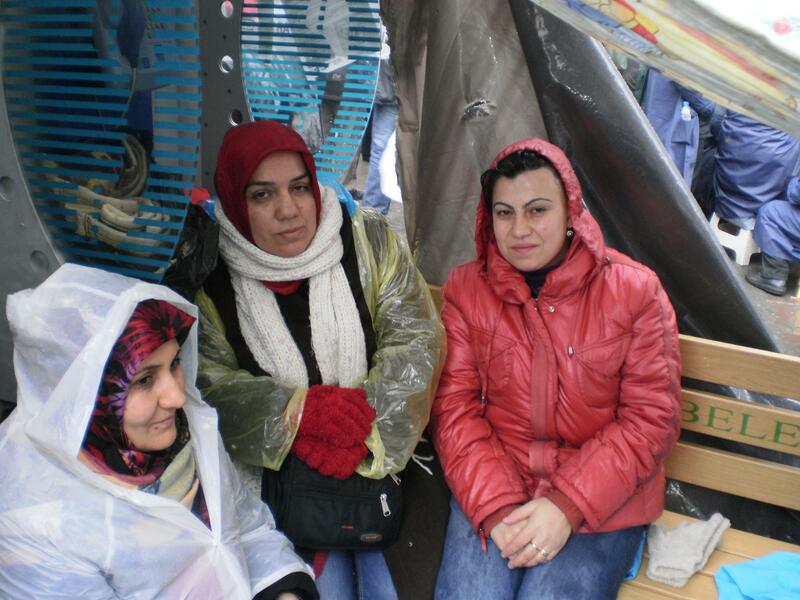 They left their families to go to the protest in Ankara. They made their own small tent, attached to a phone booth and one piece of plastic held up by an ever changing helping hand. They stayed there, day and night. And they were preparing for the 3-day hunger strike that the union was to start two days later. If that wouldn’t make the government have more regard for their needs, they planned an indefinite hunger strike, with hundreds of workers. Indefinite? ‘Yes, till death’, said the three women with a great determination in their eyes. In the end, the government invited the union for negotiations. Erdogan put three ministers on the case, and they would see if they could make the law less harsh. Yesterday the plans were revealed, but Türk-Iş has turned them down: slightly longer vacations and an income based on how many years a person has worked for Tekel, is not enough. But the union, in my opinion, is weak. When I was in Ankara, people were really preparing for an indefinite hunger strike, but the union at the last moment backed down – not that I would support an indefinite hunger strike by the way, I think it’s blackmail, but for the workers, it must have felt like a betrayal. Even more so when the union instead announced a general strike for the 3rd of February if the negotiations with the government were to lead nowhere. And now, did the union immediately announce the general strike? No, they first need to discuss it further. They just don’t make a real fist of it. At the demonstration in mid January, groups of demonstrators were already calling for the resignation of Mustafa Kumlu, the head of Türk-Iş. In their eyes he is too close to the government and too willing to make a deal, even if it’s a bad one. The reluctance to immediately call for a general strike looks like that is indeed the case – on the other hand, the government has to give permission for a strike, and if people strike without permission, repercussions can follow. Smaller unions, that are usually much more radical, are never a talking partner of the government, especially not the union for Tekel workers, Tekgida-Iş: the government tried to close them down due to having too few members, lost that battle but is giving the union no subsidy anymore, so Tekgida-Iş is lame. I think the men and women in their tents will in the end have to go home with empty hands. The men and women from Izmir, Sason, Batman, Istanbul, from all over Turkey, they were ready and determined to stand up for their rights. But they need powerful shoulders to get support from, and it seems these strong shoulders are just not there.